Read the brief and report. As global climate change continues to threaten coastal communities in the tropics, governments have increasingly focused on the promotion and conservation of mangrove forests for their protective qualities. Mangroves—trees and shrubs that grow in tropical estuaries—are among the world’s most productive ecosystems and have an impressive capacity to sequester and store carbon at high rates compared to other forest systems. They also serve as an important physical buffer, protecting coastal areas from storm surges and acting as “bioshields”. Despite these clear benefits, the world has lost approximately 20 percent of its mangrove forests since 1980. 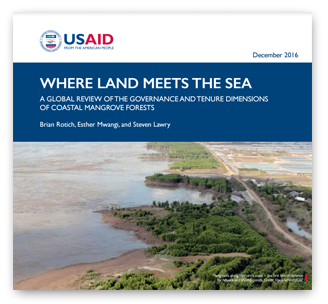 To help address this gap, USAID, in partnership with the Center for International Forestry Research (CIFOR) and Tetra Tech, are researching the state of mangrove forest governance globally. The first report, Where Land Meets The Sea: A Global Review of the Governance and Tenure Dimensions of Coastal Mangrove Forests, presents analysis of the legal, policy, and institutional frameworks that relate to the governance and tenure dimensions of mangrove forests in key mangrove countries across Africa, Asia, and Latin America. It highlights the spectrum of achievements to date, as well as challenges typically encountered in the governance and tenure dimensions of mangrove forest management. This assessment forms part of a broader study that includes national-level assessments in Indonesia and Tanzania.